Tips + Tricks Odacité Aventuri..
As the final step in the cleansing process massage pea size amount in an upward motion. Pat gently around delicate eye area. Driest skin types can indulge twice a day. For facial massage – the rich, silky texture is a perfect medium for a facial massage. Generally done at night as the last step. Take a dime size amount and massage using gentle upward and circular motions (never pulling or tugging the skin down). Include the neck and décolletage and massage until completely absorbed. For less dry skin, use a pea size amount. As an overnight mask treatment apply after a purifying or detoxifying mask (such as Honua Skin Care’s ‘Aina Mask) for extra nourishment. As a facial mask – on damp/wet skin underneath water based serums, apply a medium layer and let sit for 20 minutes or more (as long as you like). Once you are ready to remove, simply take a soft dry cloth and gently wipe away excess. Highlight – after your makeup has been applied. Dap a tiny amount on your cheek bones to provide a hint of reflection, enhancing a dewy glow. In working with sensitive and dry skin types, especially as we mature, there can be visible dullness and lack of dimension. I wanted something that would impart luminosity while also restoring and maintaining a healthy lipid barrier. This includes increasing the cell renewal process to improve the rate of repair, which slows down overtime. How long has it been part of the line? 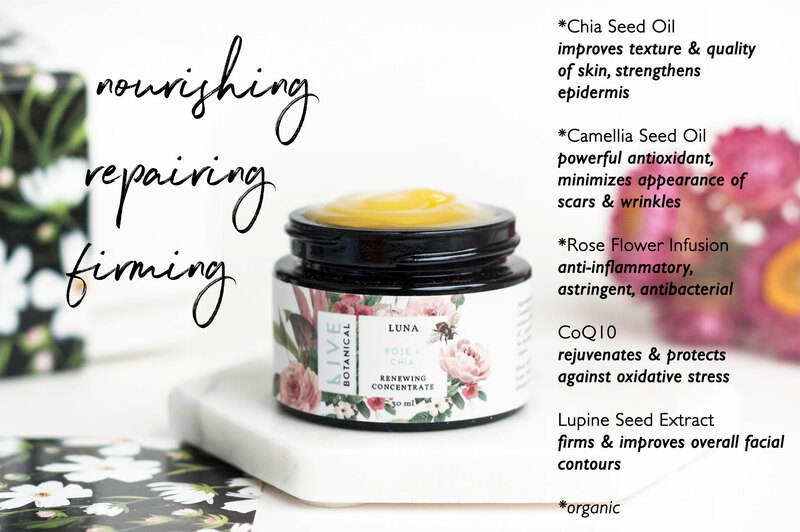 The Luna Renewing Concentrate went through a formula change early in 2018 that enhanced the antioxidants and improved the use for more sensitive skin types. Can you give us some insight on the ingredient formulation process? The herbal inspiration is a classic infusion of rose, chamomile and lavender. We source beautiful, fresh, local and organic flowers that are dried and processed in our small Portland, Oregon studio. The tonic properties of rose supports hydration by giving structural support to reduce water loss, even out the complexion and improve overall contour. Soothing properties of both the infused chamomile and cape chamomile essential oil, reduces redness and balances out more active compounds in the formula. Lavender also calms irritated skin plus the added benefit to help with potential congestion for more reactive skin types. This is then elevated by a base of organic oils and extracts to incorporate the richest combination of antioxidants and phytonutrients to recover and protect the epidermis. Chia seed oil, high in omega 3’s regulate oil production to improve hydration and plump the skin. Camellia seed oil and lupine extract encourage collagen synthesis. Abundance of carotenoids from supercritical oils of sea buckthorn and rose-hip, an important phytonutrient which not only provides an immediate glow but helps repair and prevent damage from UV, stress and environmental factors. Coupled with CoQ10, the antioxidant effects are concentrated for effectiveness. 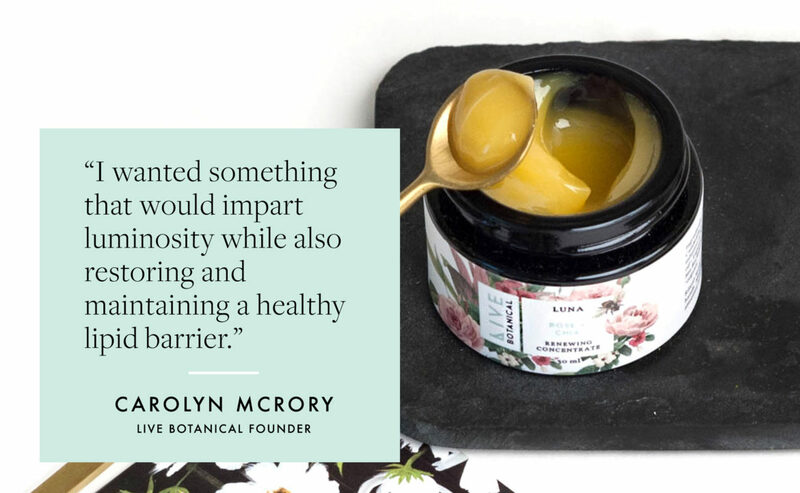 Candelilla wax, babassu and jojoba act as a plant based silicone to create a very thin, breathable layer that prevents evaporation and enables continued absorption of beneficial plant compounds.